It is difficult to imagine a life without internet today. It has become such an integral part of our existence that whether it is for work, entertainment, shopping or socializing, we are dependent on internet. One can definitely say that within the short span of three decades of its being, internet completely has altered the way humanity interacts. And we at Vcare Software Development realize that had it not been for the internet and the consequent Information Technology revolution, even we could have not emerged as an offshore web development service provider. In 1969, Gregory Gromov a professor at university of California and his students of computer science tried to connect computers of their university to Stanford University. In 1981, 213 computers at various universities of America were connected with what was known as Advanced Research Projects Agency Network (ARPANET). US Defense Department which was also operating its network through ARPANET, performed packet-switching successfully and now was operating on Transmission Control Protocol also called as the Internet Protocol. Dot com boom in 1997 – 2000 during which the hosting of websites became extremely popular and everybody had a website to call their own. Google founded in 1998 by Larry Page and Sergey Brin. Google was one of the first successful search engines, and it remains as one of the most widely used and popular search engine to date. Information Technology revolution in India and other countries, which would emerge as the best outsourcing vendors for offshore software development services. Facebook founded in February 4, 2004 by Mark Zuckerburg which stumped Orkut by Google and made social media the next big thing. Twitter was founded on March 21, 2006 by Jack Dorsey, Noah Glass, Evan Williams and Biz Stone. 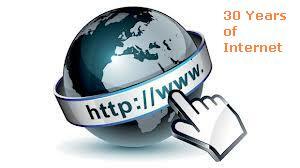 With micro-blogging, the internet became addictive and its popularity in youth increased manifold. In the coming years, there shall be more milestones for the internet. And even though it is just 30 years old, but it has enabled the humanity to leap 300 years ahead in time!